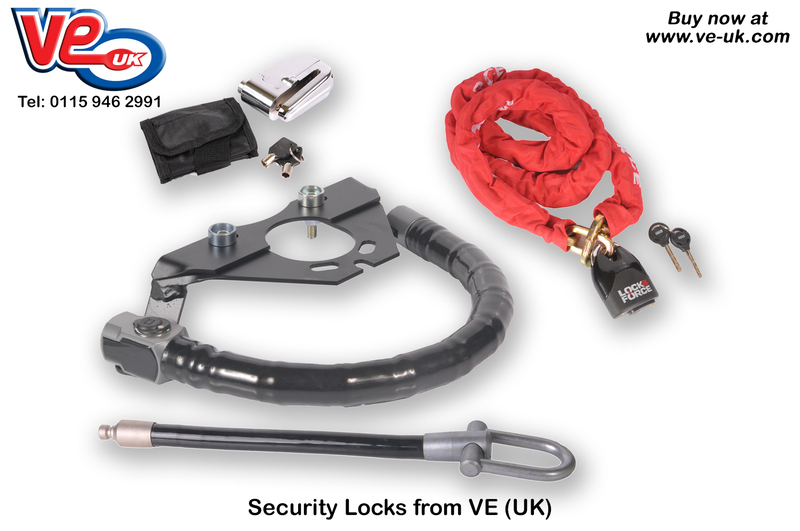 VE (UK) stock a range of high quality security products that are suitable for all two wheeled use including disc brake locks, high security chains and padlocks, and the high visibility VE handlebar to frame locks. Disc locks: Securing your bike is a must, and a disc lock is the quickest way to do it. In most cases, a lock can be conveniently stored under your bikes seat, ready for whenever & wherever your journey may take you. VE (UK) have an option to suit every budget from a simple 5.5mm pin disc lock, through to a lock with built in movement alarm for a first class deterrent. Security chains: VE (UK)s high security chains all feature a 10mm hardened steel chain with armoured padlocks, and are wrapped in a nylon cover to prevent scratches. The padlock itself features an Anti-drill lock assembly and has a hardened steel shackle. Available in 0.9m, 1.5m and 1.8m lengths. VE handlebar to frame locks: Available for a wide range of automatic scooters and the Vespa PX, the VE-CEM range of locks have been designed to offer a high visibility security solution in a compact package. A universal fitment version is also available for those machines with no dedicated fitment area. The ideal deterrent, in combination with the existing steering lock. The lock is stored around the front of the seat when not in use, and when you need to secure the scooter simply unlock the device and attach it to the end of your handlebars. As an additional deterrent a “Stick Lock” upgrade which allows you to secure the scooter to a lamp post or similar is also available This also improves the security, and provides high visibility to ward off likely thieves. A really good extra to ward off the thieves. This entry was posted in Universal parts. Bookmark this page.